Are Jamaican coins made of silver? Jamaicans have a unique way of giving monikers of people, places and even objects! And Jamaican money is no different. 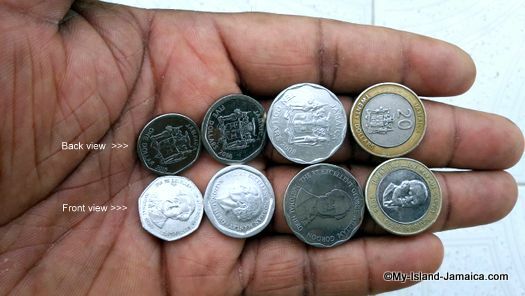 If you have ever discussed money with a Jamaican, you would have noticed that we refer to the coins as as “silver”, but it is far from that! Unlike the American currency where coins are used to represent cents, Jamaican coins represent dollars. Each coin can be individually identified because they differ in sizes and shapes. But here’s what really makes the coins stand out! On each coin, you will find the image of the Jamaican Coat of Arms engraved on the back, while on the front a National Hero is portrayed. And on the twenty-dollar coin the Rt. Excellent Marcus Garvey is portrayed. But let’s get back to our title question, “Are Jamaican coins made of silver?”. It’s kind of obvious how the moniker came about, since most of Jamaica’s coins are silver in appearance. However, this is not the case. Here is the make up based on the coin. Smallest of the four coins, the one-dollar coin has a diameter of 18.50mm and has a 7-lobed shaped. The one-dollar coin is made up of nickel-plated steel. The five-dollar coin has a diameter of 21.50mm and is roundly shaped with 8 lobes in the circle. It is also made up of nickel-plated steel. The ten-dollar coin has a round shape with scalloped edges. It has a 24.50mm diameter making it the largest of the four coins in Jamaica. Like the one-dollar and five dollar coins, the ten-dollar coin is made up of nickel-plated steel. The twenty-dollar coin has a round shape with alternate plain and a diameter of 23.00mm. Now, unlike the other coins the make-up of this coin is a bit different. Two different metals makes the outer and inner part of this coin. Nickel-brass composes the outer part of the coin while cupro-nickel makes up the inner part of the coin. You'd have never guessed they were this intricate right?